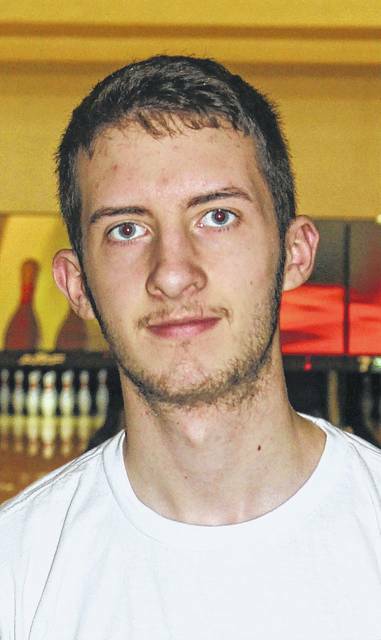 Washington High School junior Brandon Underwood was busy Wednesday, fine-tuning his game as he prepares for his first appearance at the Division II State bowling tournament coming up Saturday morning in Columbus. Underwood, along with his Blue Lion teammates, competed in the District tournament at Shawnee Lanes in Chillicothe Friday, Feb. 24. The Blue Lion team placed eighth out of 10 with a team total of 3,688. Underwood shone through with a fine three-game series total of 660, placing third at the District. Senior Tyler King of Hillsboro won the District with a 673 score. The Indians won the District with a 4,224 team score. That means that King qualifies to State as a team member. Second place, and the first individual qualifier, senior Ryan Clarke of Maysville, bowled a 671. Underwood was the second individual State qualifier with the above-mentioned 660 score. Bowling gets underway Saturday morning at 10:30 a.m. at Wayne Webb’s Columbus Bowl, located at 3224 South High Street. Underwood began the District with a first-game score of 182. He quickly ratcheted up his game with a 245 score in the second game and rounded it off with a 233 in the third game. Teammate, sophomore Austin Knisley, was 17th with a 602 (205, 208, 189); junior Grant Mustain was 46th with a 479 (181, 147, 151); sophomore Allan Schreckengaust was 59th with a two-game total of 303 (156 and 147); junior Chase Spangler was 60th with a two-game total of 293 (123 and 170) and junior Alex Behrends bowled a two-game total of 284 for 62nd place (165 and 119). This will be Underwood’s first time competing at the State tournament. What about goals for the State? “I have a college coach that e-mailed me about this and he told me to just relax and have fun and enjoy the experience,” Underwood said. “So, I’m going to take his words and just go up there and have some fun with it. As far as his career-best three-game series, Underwood said, “I believe it’s a 723. That was a couple of years ago.” The 660 series is just six pins from his best series this season. Underwood reflected on this season. Underwood’s head coach is his father, Mark. It’s a not unheard of occurrence in high school to have a parent coach one of their kids in a varsity sport. In practice, Underwood said he is mainly working on just picking up spares. Underwood was quite appreciative of his teammates. “He’s worked for it,” Washington Blue Lion head coach Mark Underwood said. “He’s put a lot of work in. I’m proud to see him go on. It is quite the accomplishment. “His 660 (at Districts) is the fifth-highest score going in to the tournament,” Underwood said. “He’s right there. If he goes up there and bowls like he can and stays within himself, I think he’s got just as good a shot as anybody up there, to be honest. The father and son duo have a history of bowling together. “I started him up here (at LeElla Lanes) when he was about eight,” Underwood said. “We joined the leagues here; the Mickey Mouse League, the Wild Bunch League, the Child-Adult League. We’ve bowled together. “Through all that, I’ve learned his tendencies,” Underwood said. “I can see what he’s doing just standing behind him. So, it’s real easy to watch him, compared to the other kids on my bowling team, because I’ve seen him so much. I know his tendencies to the point that I can dial him in to a pattern pretty quickly. “That’s part of the father-son relationship,” Underwood said. “We kind of think alike. “Our District is probably one of the toughest in the state,” Underwood said. “Three of the top five scores in the state came out of our District. It’s pretty tough to come out of there as an individual. There was one 700 score shot and a 668. Those were the other two scores ahead of Brandon.” As well as the 673 and 671 mentioned above from the Chillicothe District tournament. One of the primary keys to bowling a competitive game or series, according to Underwood, is, just pick up your spares.